Putra Komuter station is a Malaysian commuter train halt in Kuala Lumpur named in part after the Putra World Trade Centre located nearby. The halt forms part of a common KTM Komuter railway line shared by both the Rawang-Seremban Route and the Sentul-Port Klang Route. 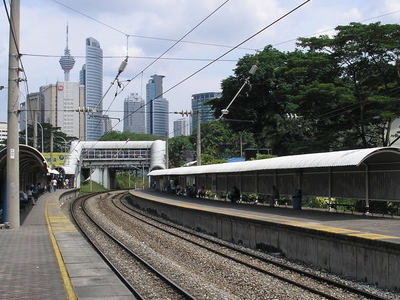 The halt is also the northernmost station in the KTM Komuter network where trains from both the Rawang-Seremban Route and the Sentul-Port Klang Route stop. Here's the our members favorite photos of "Railway Stations near Chow Kit". Upload your photo of Putra Komuter Station!